Neutral doesn’t just mean beige. Tan, white, gray, black, and greige are classic neutrals that will never go out of style, and muted or washed out tones of any of your favorite colors can produce beautiful neutral colors. Click HERE to read "Gearing Into Neutral," a recent blog post by the The Northern New Jersey Scout Guide. Butler's of Far Hills was scouted for Jeff's unique creation of a quiet retreat just off the family eating area in this Nantucket home, and the custom putty toned cabinetry creates a cozy nook. Throw pillows with graphic and architectural patterns add energy and traces of marine and cornflower blue are reminiscent of coastal ocean tones and blue skies. When working in neutral tones Jeff often uses contrasting or interesting textures in the space. Here, the play on the typical wing chair is found in a raw toned wood, with custom tufted upholstered covering. 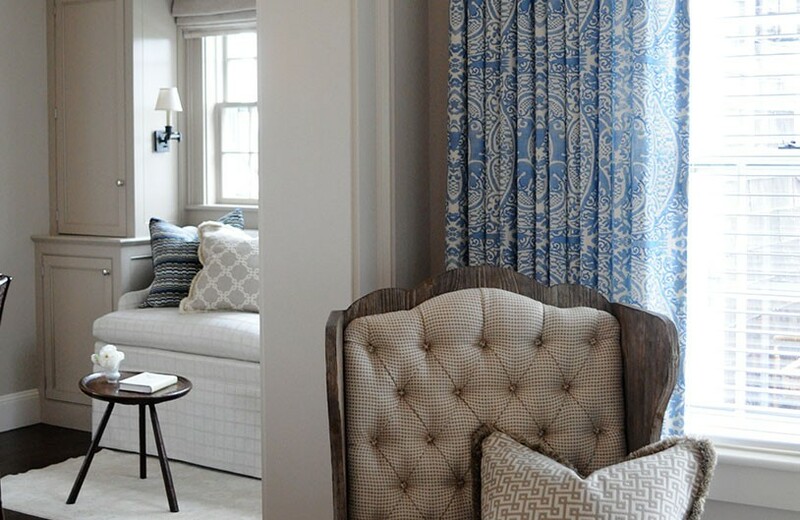 Window treatment fabric is Quadrille.